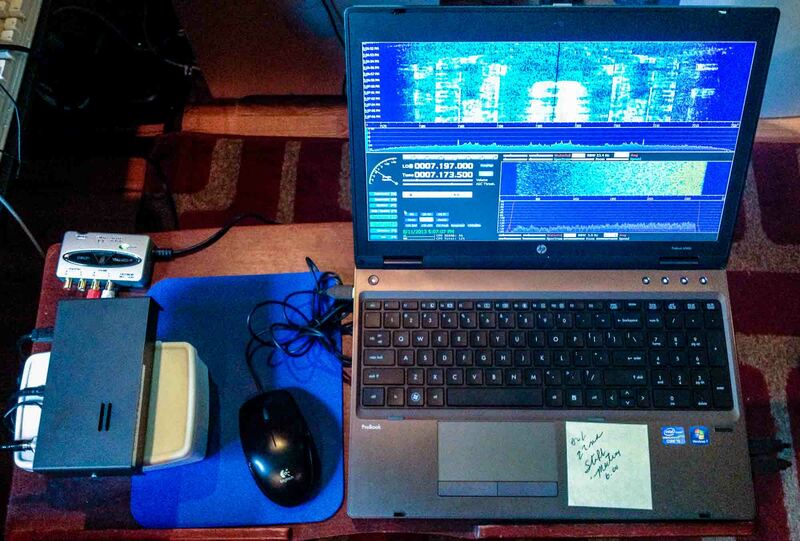 Jeffrey Fritz (WB1AAL) contacted me with details about his SDR (Software Defined Radio) “Go Kit” and has kindly allowed me to post it. As a reader of the SWLing blog, I know that you are very interested in SDR. And you probably know that a “Go Kit” is a portable ham radio system in a case that can be moved at a moment’s notice and set up at another moment’s notice virtually anywhere. I have a VHF Go Kit made up for emergency events. It is complete with waterproof carrying case, Aden PCS-7000H two-meter transceiver, a Kenwood VHF tuner, a Kenwood SW-100 VHF SWR bridge and two antennas (a 2-meter J-pole made out of twin lead and a two meter mag mount.) But what if there is a need to monitor the HF bands during the same event? Now that I own a Flex-1500 SDR transceiver, the Softrock Ensemble SDR receiver that I bought a while ago has become somewhat redundant. It is still a serviceable radio and works fine, but it can’t hold a candle to the amazing Flex-1500. While I could turn it into a panadapter or sell it on eBay, eHam, etc., I had a better idea. To monitor the HF ham bands, I could use something like my Grundig G3 shortwave radio in my Go Kit. While it is portable, battery operated and will tune LSB and USB, listening to SSB or even CW in an emergency situation with the G3 can be a bit of a chore. (Think of the old boat anchors with their main tuning and fine tuning band spread dials, but now make both dials tiny and you’ll get the idea.) 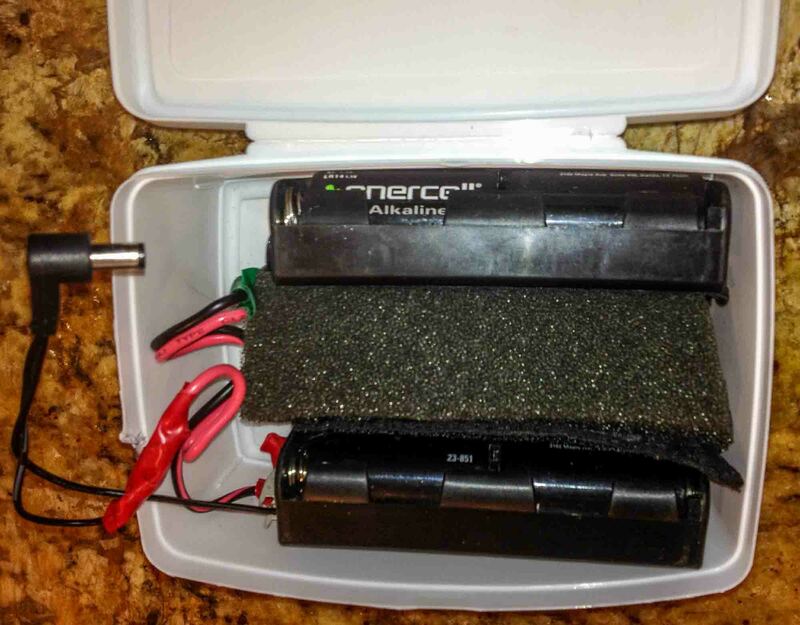 Instead, why not build a 12-volt battery supply with common, easy to obtain batteries? I could connect it to the Softrock Ensemble and then via a USB audio interface to a battery powered laptop. Add a pair of headphones and we are in business. That is just what I’ve done. The Softrock Ensemble draws 18 mA at 12.6 volts (my measurement.) An Alkaline ‘C’ battery can supply up to 8,000 mAh, so doing some math and assuming fresh batteries, the battery pack should run the radio for roughly 400 hours. (Hopefully my math is correct!) If so, then I think that the laptop batteries will give out long before the life span of the C Cell is reached! Jeff, this is an excellent use for the Softrock Ensemble. I imagine it will run for a very long time drawing only 18 mA. I have a “Go Kit” for QRP ham radio purposes and one for SWLing during travels. You’ve inspired me to piece together a proper receiver “Go Kit” to be used in case of emergencies. Readers: If you have a project, like Jeff, that you’d like to share on the SWLing Post, feel free to contact me with details! This entry was posted in Articles, How To, Kits, Preparedness, Radio Modifications, Radios, Shortwave Radio, Software Defined Radio, SWLers and tagged Jeff Fritz WB1AAL, Preparedness, Softrock Ensemble, Softrock Ensemble Go Kit on August 12, 2013 by Thomas.